JunkieRush performing live at Will's Pub in Orlando, Florida, on January 29, 2003. Thie first photograph features, from left to right, Aaron O'Riley on bass guitar, Bobby Koelble on electric guitar, Matt Hughen on drums, and Marc Clermont on percussion. 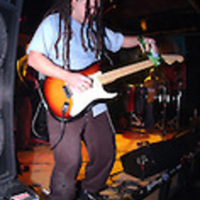 The second photograph shows Koelble playing an acoustic guitar, and the third features Koelble playing an electric guitar, using a Rolling Rock beer bottle as a slide. 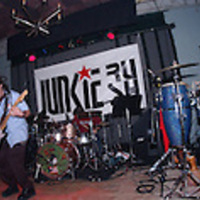 Formed in 2000 by guitarist/vocalist/songwriter Bobby Koelble, who was also a member of the seminal metal band Death, JunkieRush is an Orlando-based rock band that combines elements of funk, punk, Latin, reggae, ska and world music into a unique original sound. The band has gained a reputation for its live shows, performing up the east coast from Florida to New York, as well as the Virgin Islands and Puerto Rico. Although quite a departure from his metal roots, JunkieRush still features the strong guitar work that Koelble is known for. The original lineup consisted of Koelble on vocals and guitar, Chris Charles on saxophone and keyboard, Aaron O'Riley on bass, Marc Clermont on percussion, and Matt Hughen on drums. As of 2015, the lineup consisted of Koelble, bassist/vocalist Matt Gallagher, saxophonist/flutist/vocalist Nathan Anderson, drummer Thatcher on drums, and percussionist George "Ito" Colon. The band's albums include Junkie Rush (2000), II (2004), Live (2006), and Musica (2009). Original color photographs by Alicia Lyman: Archive: Concerts Archive, Alicia Lyman. Digital reproduction of original color photograph by Alicia Lyman, January 29, 2003: http://alicialyman.photoshelter.com/gallery-image/2003-01-29-JUNKIE-RUSH-Wills-Pub-and-after-party-Orlando-FL-gallery/G0000vGFmkJjJQL4/I0000zbWCJBYP8j8/C0000i75h9FD_Cjw. Digital reproduction of original color photograph by Alicia Lyman, January 29, 2003s=. http://alicialyman.photoshelter.com/gallery-image/2003-01-29-JUNKIE-RUSH-Wills-Pub-and-after-party-Orlando-FL-gallery/G0000vGFmkJjJQL4/I0000p.WZdclksxk/C0000i75h9FD_Cjw. Manes, Billy. Under the influence of Bobby Koelble.” Orlando Weekly. April 26, 2000. http://www.orlandoweekly.com/orlando/under-the-influence-of-bobby-koelble/Content?oid=2259145. Freed, Tim. Koelble's Relentless Curiosity About Music.” UCF Today. March 19, 2012. http://today.ucf.edu/koelbles-relentless-curiosity-about-music/. Lyman, Alicia. 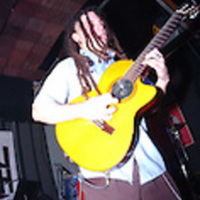 “JunkieRush at Will's Pub, 2003.” RICHES of Central Florida accessed April 21, 2019, https://richesmi.cah.ucf.edu/omeka/items/show/5318.